DeWitt’s originals are enjoyed, collected and valued by art enthusiasts around the world. Well known collectors include Dennis Conner, Buddy Melges, Bill Koch and Roy Disney. 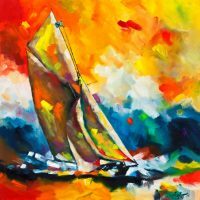 Jim’s racing paintings are in private and corporate collections, and are on permanent display internationally in many prestigious yacht clubs.